ESP, PDAM Cianjur dan Politeknik Negeri Bandung membantu warga Kampung Tanjakan Kulon, Desa Padaluyu, Cianjur membangun sarana air minum bersih yang lebih dekat dengan pemukiman penduduk. 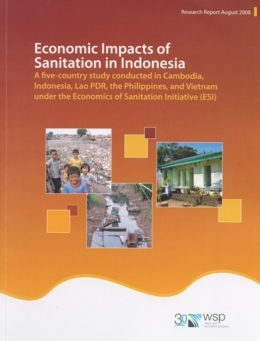 This is the first study in Indonesia to compile economic evidence on a range of impacts of poor sanitation and hygiene. The results indicate that poor sanitation and hygiene have significant financial and economic costs, with major implications for the socio-economic development of Indonesia and the attainment of short, medium, and long term development goals. The study highlights the links betwen improved sanitation and several other MDG targets, including poverty, hunger reduction, gender quality, child health, access to safe drinking water, and the quality of life of slum-dwellers. The study demonstrates that poor sanitation affects everyone, but especially the poor and vulnerable, including children, women, the disabled and senior citizens. Hence, sanitation should receive greater attention from all levels of Indonesian government, and from development partners, the private sector and households. Decision makers should act now, and in a concerted way, to stimulate demand for improved sanitation and hygiene practices, at the same time increasing the opportunities for households to safisfy their demand. Pustaka ini memperkenalkan 21 good practices dalam kegiatan lingkungan berbasis masyarakat di Indonesia. Pustaka ini disusun sebagai sarana untuk berbagi pengetahuan dan pengalaman dalam kegiatan lingkungan berbasis masyarakat, untuk para pakar yang terlibat dalam pendidikan lingkungan dari lembaga-lembaga terkait, termasuk instansi pemerintah pusat dan daerah, LSM, perusahaan swasta dan lembaga donor, agar kegiatan lingkungan dapat mengalami peningkatan lebih lanjut. Bidang-bidang kegiatan lingkungan yang disebutkan dalam pustaka ini pada dasarnya meliputi konservasi hutan, konservasi air dan tanah, konservasi ekosistem, dan pengelolaan sampah dengan 3R. Fokus utama pada 15 dari 21 good practices adalah pengelolaan limbah dengan 3R, karena terbatasnya informasi dan studi mengenai isu ini. 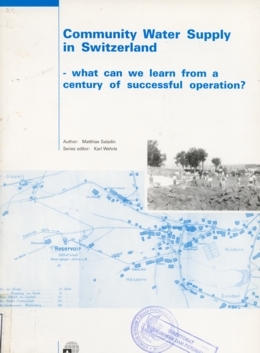 Community Water Supply in Switzerland: What can we learn from a century of successful operation? In the last decade there has been a marked shift towards decentralisation in many developing countries as responsibilities are passed from national administrations to local authorities. In many places this shift to a local approach has left the communities isolated and struggling. Many infrastructures projects are in difficulties because of the lack of organisational support and know-how. In Switzerland, rural communities have developed and managed their own water supply networks for a long time – in some cases over 100 years. There may be lessons that have been learned in Switzerland over this period that could be helpful – if properly adapted – to communities in developing countries as they take responsibility for their own systems. They management of water supply schemes in Switzerland is very much the responsibility of the individual communities. In many villages these systems were initiated before the end of the nineteenth century and have proved to be appropriate and sustainable over a long periode of time. This publication is not an attempt to promote the ’Swiss system’ as a model for developing countries, but rather seeks to recount some experiences that may be helpful or relevant. Even if the Swiss approach cannot be exported as it is, there still may be some lessons to be learned from more than a century of experience. These shall be pointed out and illustrated in this publication. The study on hand focuses on villages – settlements of up to 10.000 inhabitants. 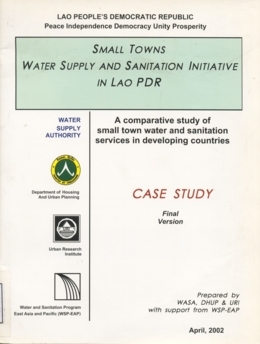 The history of village water supply systems is quite different from the experiences of the cities, which are beyond the scope of this study. The goal of this publication is to pass on important Swiss experiences to policy- and decision makers and practitioners in other countries, especially in the South. For this purpose, a set of case studies was selected to represent a wide range of different organisational arrangements. There are two important concepts underlying this study: the ’household-centred approach’ (HCA) and ’balanced development’. (These are described briefly below). The ’household-centred approach’ is a concept that puts the household in the centre of infrastructure projects such as water supply networks or sewers. The idea beneath this concept is taht any decision about water supply or sanitation should attempt to solve the problems as close to the household level as possible. Only if a problem cannot be tackled on one level should a solution at the next level up be considered. In this way more decentralised, bottom-up solutions can be provided, in the hope that they will be more sustainable than the existing ones. ’Balanced development’ is a strategy that takes into account the many different aspects of development projects. The various fields of focus are: social, institutional, economic, and technological aspects, and rules and regulations, knowledge and skills. Any project should be assessed by its implications in all these fields. Additionally, there are environmental issues, which typically are addressed throughout all fields of focus. The present report is structured along the tematic fields of the balanced development strategy. Buku ini berisi hasil studi keberhasilan program Proair dalam membangun sarana air bersih di Desa Praibakul-Taramanu, Kecamatan Wonokaka, Kabupaten Sumba Barat, Nusa Tenggara Timur.